The Spring 2018 Exemplar Wave (Wave #13) is live. The Wave 13 review is complete and the nominations are posted on Judgeapps! You can see nominations you gave and received here or use the search tool to see all the awesome things your fellow judges are doing; at home, at events, online, or in their community. Additionally, if you discover you cannot find a nomination that you wrote, that means it was deferred. We will be providing a personalized email explaining why the nomination was deferred. These emails will be sent in batches over the next two weeks. 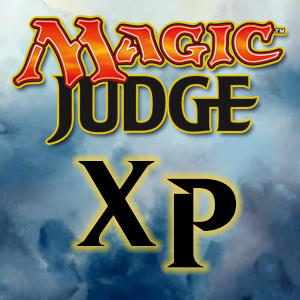 Your deferred slot will appear in Judgeapps for Wave 14 nearly immediately. The announcement of Wave 14’s Vanguard selection. A post highlighting some of our favorite nominations from this wave. I also want to give Rob McKenzie a big ‘Thank You’ for the tokens last wave, and the upcoming ones this wave. Rob coordinates the creation and printing of the tokens, and they were very well received last wave. I’ve seen several people comment online about how cool the tokens are, and I’ve gotten direct positive feedback regarding them as well. This is a surprisingly complex logistical task where he is dependent on the quality and timeliness of others outside the Judge Program, and yet Rob has still found a way to “make it work”. As a final reminder, Wave 14 is currently open and ends Aug. 14, 2018, 23:59 PST.